One more cookie? OK, January 1st is when you’ll start your diet. Spend another $25 on a gift? Why not, you’ll turn things around next year. It’s the end of the year, and we all tend to compromise with ourselves at this point in the game. Why? Because we’ll set resolutions soon, and next year will be different. However, I propose that mid-December is actually the best time to sit down and sketch out your goals for next year. Here’s why. Chris Gillebeau at Art of Non-Conformity advocates conducting your own annual review. It’s not just about setting goals for the next year, it’s about reconsidering the past. Right around the holidays it can be difficult to put your life in perspective because so much time is spent with friends, family, and coworkers, comparing your life to theirs. For instance, think of some of the holiday letters you get — you know the people — “Happy Holidays — We hope you’ve had a wonderful year! This year we celebrated our 30th anniversary on a private island surrounded by piles of money and our oldest son got married to a supermodel...“ Don’t compare yourself to them. A healthier perspective is comparing your own life to your own goals. It doesn’t matter if you’re encountering year-end work deadlines, taking finals for school, shopping for last minute Christmas gifts, or shoveling out from a giant snowstorm — this time of year is busy for everyone. When each day passes so quickly, it’s necessary to stop and enjoy the moment. Writing your goals will help you do just this. Need more inspiration for slowing down? I love Gretchen Rubin’s video “The Years are Short." If you want to set a resolution that actually sticks, you can’t just reboot on January 1st. If you set your goals today, you’ll find yourself making conscious choices over the holidays. 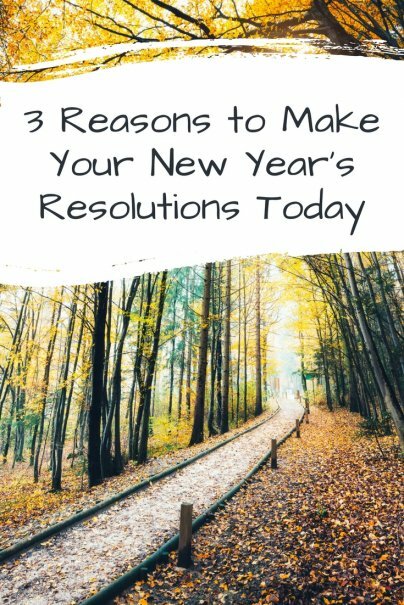 Yes, maybe you’ll eat the extra cookie or spend that extra $25, but you’ll be more likely to take a walk around the block afterward or sell that extra microwave on Craigslist (that you’ve been meaning to list for months). So go ahead and enjoy the splurges or the holiday season — just make sure that you're aware of your goals and making conscious choices.